Your Impossible dream made possible at MyImpossibleDream.info! Your impossible dream made possible! Yes that's right with Coke Zero, Hadd Ghalik & Deal or No Deal. 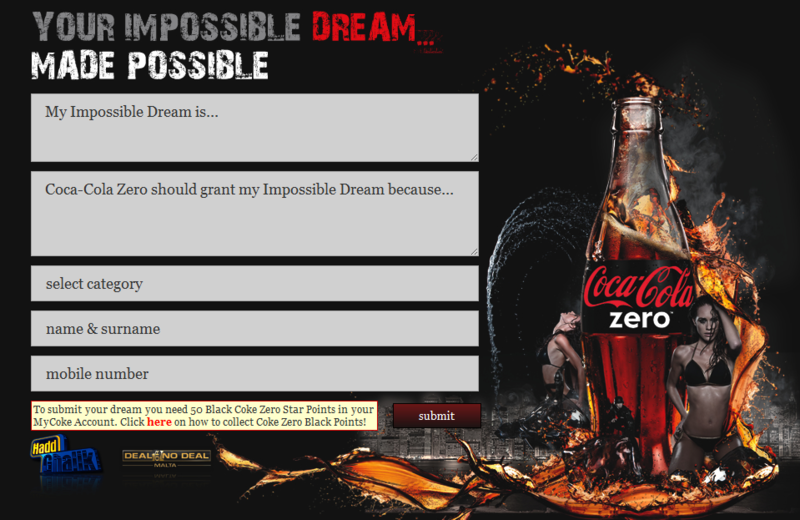 Myimpossibledream.info is another project developed by Abakus Solutions for General Soft Drinks Ltd.
MyCoke registered users can log in to Myimpossibledream.info and fill in the form supplied with what their impossible dream is and why they think Coca-Cola Zero should grant their impossible dream in exchange for 50 MyCoke black star points. On submit the form which is integrated to the MyCoke Star Point system deducts the points from the user's account and submits their impossible dream to Coca-Cola Zero. Login to MyImpossibledream.info and start dreaming now!